Dotmailer just rolled out their third release of 2015 with three main new features introducing lead soring to score leads and customers based on their suitability and engagement with a brand. 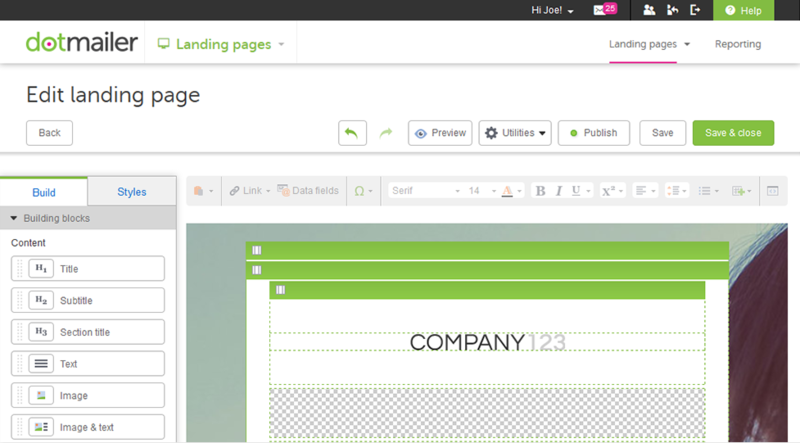 Allowing to build custom landing pages in dotmailer and an update to the EasyEditor for advanced personalization on landingpages and in email marketing messages. A Marketing team can decide upon priorities and score lead based on it. These scores can then be given meaning by labelling contacts as ‘Contact now’, ‘Of interest’, ‘Cold’. Scores are updated daily. The lead scoring can also be used for segmentation, to drive dynamic content and use them in programs to enrol contacts or make decisions. Useful for lead nurturing programs. Dotmailer also shows off their new landing page builder in this release. It is based on the EasyEditor, meaning it has similar drag and drop functionality There are premade templates available and possibility to for a user to upload their own designs. After publishing, the landingpages can be edited and can be hosted on either dotmailer’s hosted domain or any custom domain. Dynamic content can be used to personalise the landing pages. Users can pull in countdown timers, display videos and use it with connectors like GoToWebinar. Personalisation was always possible in dotmailer through contact data fields, with dynamic personalisation, with segmentation, send time optimisation, and with external dynamic content. Now Liquid script markup language (developed by Shopify) is added, to personalize campaigns and landing pages. It can personalize the body of text content with information specific to each individual contact, including OrderInsight data, WebInsight data and account-wide Insight data (an example is to send products from a catalogue or a suitable choice of preferred holiday resorts). A user can set multiple rules and send to multiple segments. Liquid scripting can be used in the EasyEditor for campaigns and landing pages. The new version of the Magento connector. In it the navigation menus have changed a little and reporting has been added. For instance programs now enrol in batches every fifteen minutes, and this can be checked in the ‘Automation Status’ report. A new ‘Importer Status’ report, gives information about imports, whereas previously this wasn’t available. The Magento connector v5.0.0 also allows to enrol customers into programs when there’s a change in their order status; Catalogue synchronisation and reporting has been introduced. Marketers can create exclusion rules to prevent abandoned cart mails and review emails from being sent.